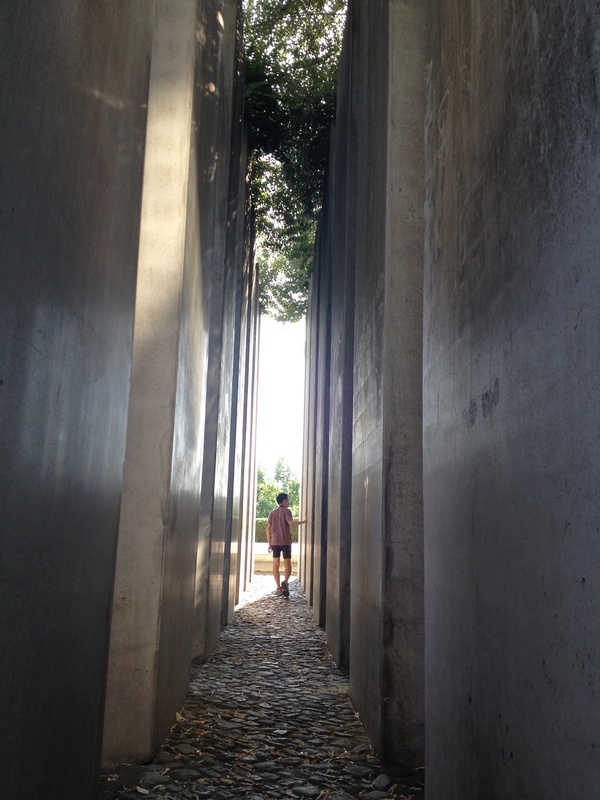 Berlin, the capital city of modern Germany, has an intriguing history. The Slavs who originally inhabited the region called it berl “swamp,” which sounded similar to the German Bär “bear.” Coincidentally, the first Margrave of Brandenburg Albrecht I was nicknamed “the Bear.” Therefore, it is not surprisng that the image of a standing bear has found its way on the guild seal, signet ring and coat of arms of Berlin. 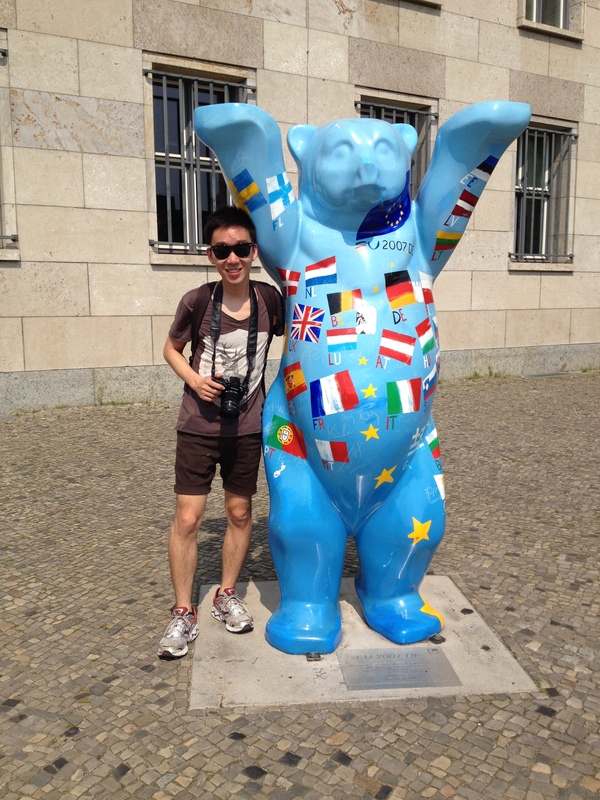 And there are even quite a few life-size statues of Buddy Bears on Berlin streets and squares. My dear brother cuddled with one of the Berlin Buddy Bears. In 1415 Friedrich I became the first from the Hohenzollern family to rule in Berlin. According to Wikipedia “History of Berlin”: “Subsequent members of the Hohenzollern family ruled in Berlin until 1918, first as electors of Brandenburg, then as kings of Prussia, and finally as German emperors.” Members of the royal Hohenzollern family are now buried in the Berliner Dom (Berlin Cathedral). This branch of the Hohenzollern family was Protestant, so the statutes of the four leaders of Reformation (i.e. Martin Luther, John Calvin, Philipp Melanchthon, and Huldrych Zwingli) loom large alongside the biblical reliefs and mosaics that decorate the walls, niches, and ceilings of the cathedral. The glass windows behind the altar contain colorful depictions of the birth, death, and resurrection of Jesus Christ. Standing on the two columns near the altar are the statues of Martin Luther and John Calvin. The reliefs above the arched niches are several scenes from the Acts of the Apostles. The mosaics on the ceilings of the four small niches are the images of the Four Evangelists. On top of the huge organ is a golden statue of David, who is traditionally thought to be the author of most of the Psalms. 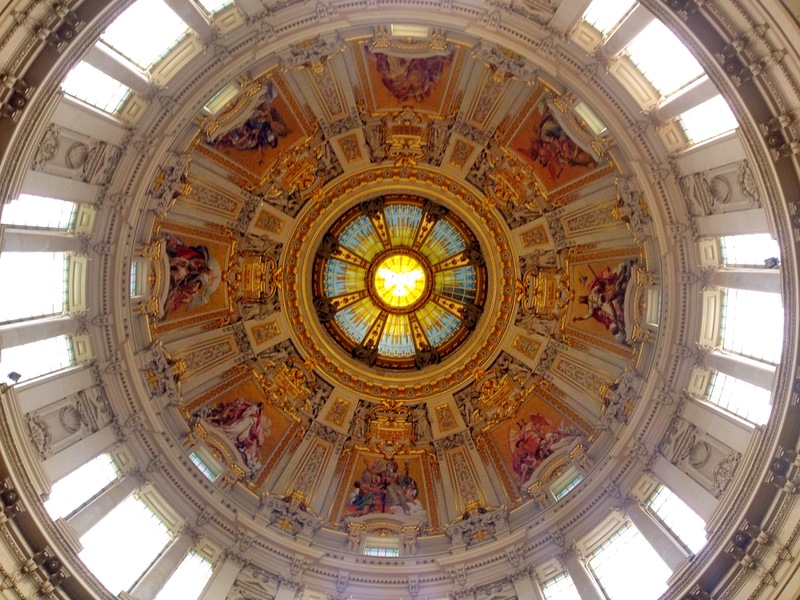 The dome of the Berlin Cathedral depicts eight angels representing the eight Beatitudes (Matthew 5:3-11): 1. Blessed are the poor in spirit, for theirs is the kingdom of heaven. 2. Blessed are those who mourn, for they will be comforted. 3. Blessed are the meek, for they will inherit the earth. 4. Blessed are those who hunger and thirst for righteousness, for they will be filled. 5. Blessed are the merciful, for they will be shown mercy. 6. Blessed are the pure in heart, for they will see God. 7. Blessed are the peacemakers, for they will be called sons of God. 8. Blessed are those who are persecuted because of righteousness, for theirs is the kingdom of heaven. Since the eighteenth century, the European colonialism in the Middle East and their interests in the biblical stories have played a role in initiating the European studies of the ancient Near East. 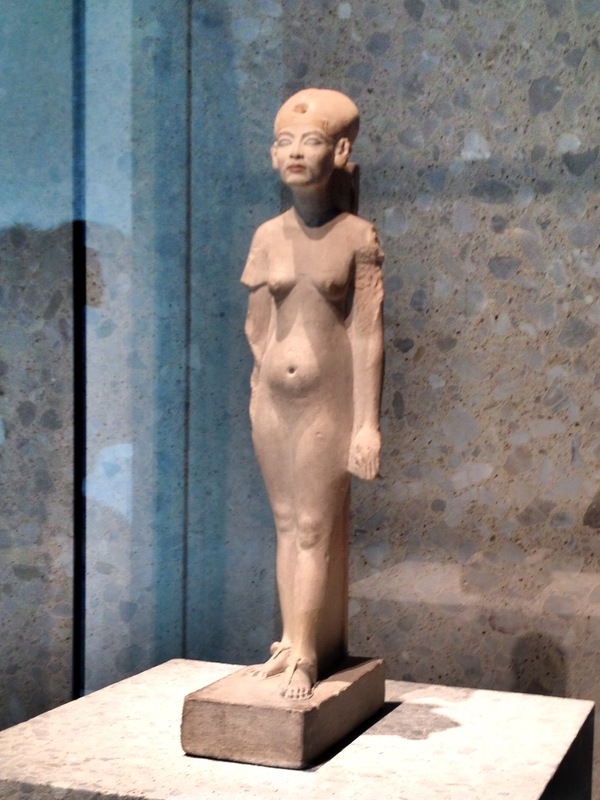 Therefore, do not be surprised by the vast amount of archaeological treasures collected from Egypt, Mesopotamia, Syria, and Anatolia in the Pergamonmuseum and Neues Museum on the Berlin Museum Island. TOP: The Mushhushshu “dragon” is the symbol of the Babylonian city god Marduk, who has the head and body of a snake, the front legs of a lion, the hind legs of a bird and a scorpion’s sting in the tail (excerpt taken from the placard in front of the Ishtar Gate). MIDDLE: Apkallu griffin is a “wise man” or “sage.” Babylonian tradition says that there were seven Apkallu who lived at the beginning of time before the flood. They were sent by the god Ea to teach wisdom to humans. They are shown as humans with wings. Some have the head of a bird, while others don’t have wings and are dressed in the skin of a fish. They protected people and sometimes hold a bucket and cone for purifying (excerpt taken from http://www.mesopotamia.co.uk/gods/explore/exp_set.html). BOTTOM: A Lamassu was a human-headed winged bull or lion. Huge sculptures of Lamassus guarded Assyrian palace doorways and city gates. They were there to frighten away the forces of chaos (excerpt taken from http://www.mesopotamia.co.uk/gods/explore/exp_set.html). After World War I (1914-1918), the royal Hohenzollern family was overthrown and the Weimar Republic (1918-1933) was established. 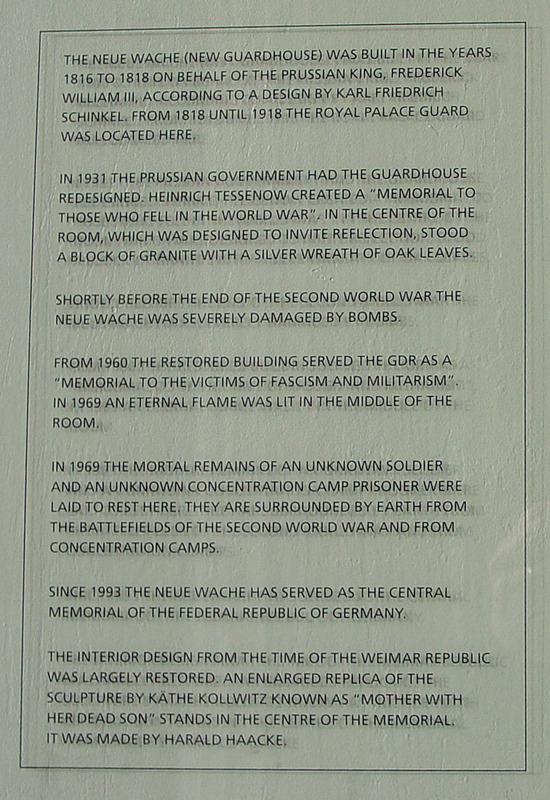 In 1931, the Prussian Prime Minister Otto Braun turned the Neue Wache, which had served as a guardhouse displaying the Prussian military might, into “die Gedächtnisstätte für die im Weltkrieg gefallenen Soldaten” (the Memorial site for the Fallen of the World War). 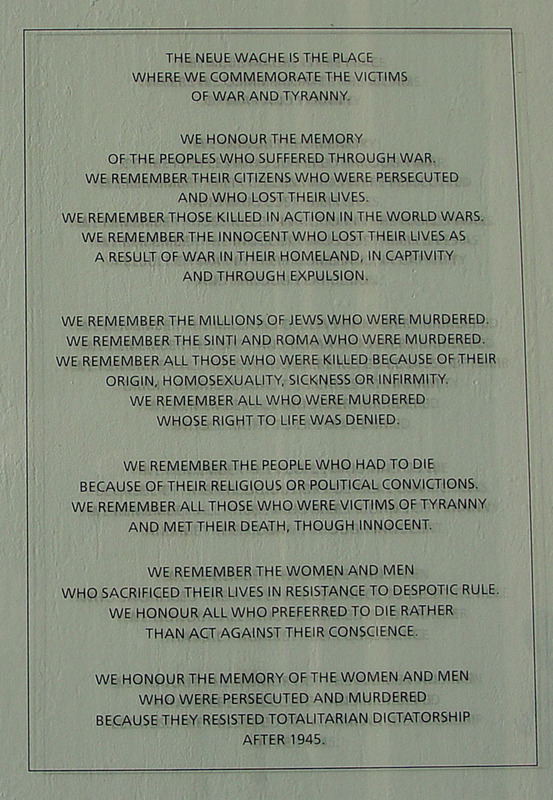 Having a pacifist mindset, Braun said that the site was dedicated for those who had “sacrificed their blood in a way never before imagined in world history, and in a way, as we hope and as we will try to ensure, that the course of history will never call for again.” (excerpt taken from Prof. Harold Marcuse’s fine paper entitled “The National Memorial to the Victims of War and Tyranny: From Conflict to Consensus”). Then the Nazis came, added a crucifix to it, and renamed the memorial as “Reichsehrenmal.” The American tour guide told us that the Nazis’ adding of the crucifix was to exclude the fallen Jews during the World War I from being commemorated. It is absolutely horrifying! I consider myself to be a Christian, but if this nationalistic kind of Christianity is what we are talking about, then I want to have nothing to do with it! After World War II, under the influence of SED (the communist party who led the DDR [or GDR in English]), the memorial changed its name again to “Mahnmal für die Opfer des Faschismus und Militarismus” (Memorial for the Victims of Faschism and Militarism). 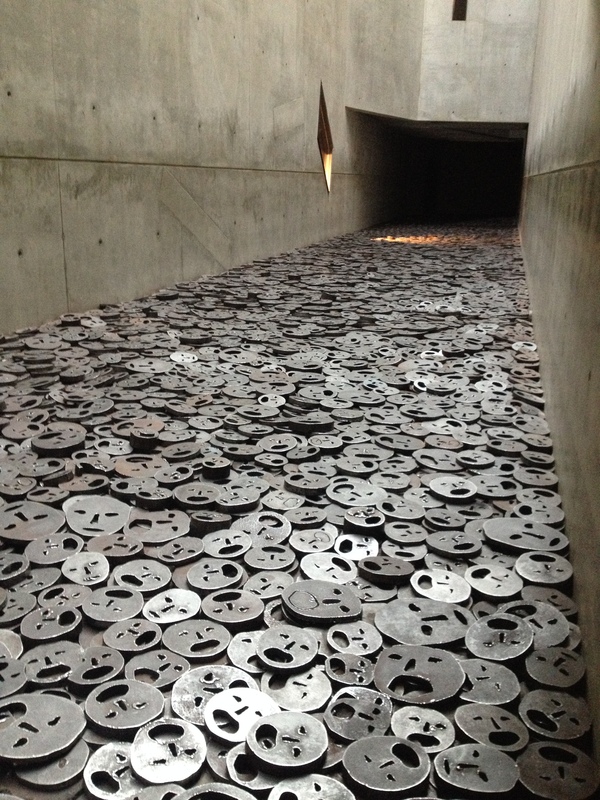 Only now, the memorial has a more inclusive name – “Zentrale Gedenkstätte der Bundesrepublik Deutschland für die Opfer des Krieges und der Gewaltherrschaft” (Central Memorial of the Federal Repbulic of Germany to the Victims of War and Tyranny). 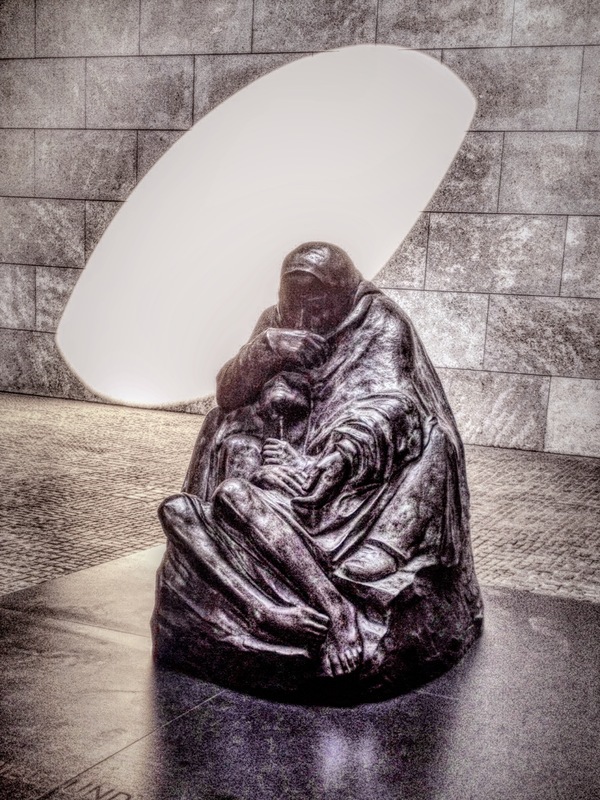 Isn’t it interesting to see how the changing names of Neue Wache have reflected the changing politicians in power? Different people have different opinions of who they want to exclude or include. This is the epoch of German history I am most intrigued by. When things are not going well for one group of people, they are often desperate enough to find a scapegoat/scapegoats to account for their misfortunes. They become blind to, intolerant of, and agitated with other opinions not in their favour. This is precisely what happened to the elected Nazis Government, which wanted to get rid of anything that “contaminated” the “more superior” German tradition. 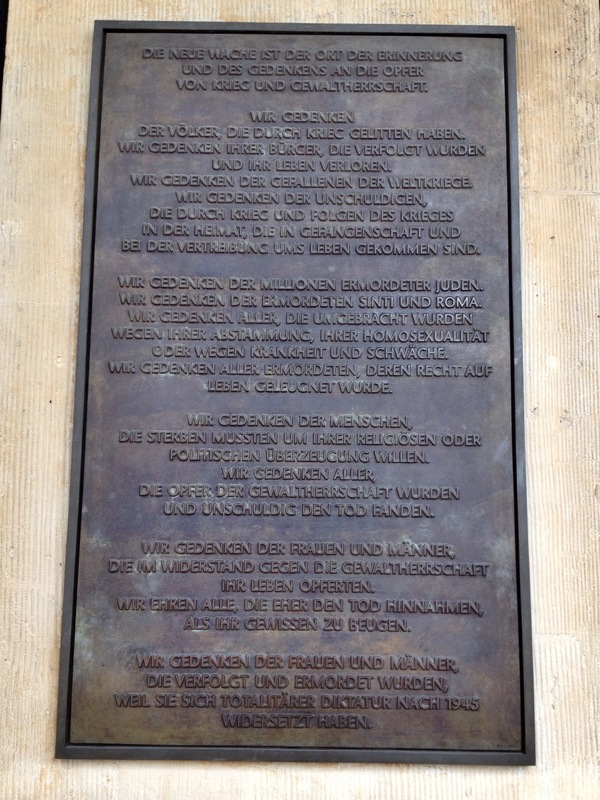 Under the slogan “Wider den undeutschen Geist” (Against the un-German spirit), the first big official Nazi book-burning took place in May 1933 at Bebelplatz. The aim was to cleanse Germany from the works of anti-nationalistic, jewish, and communist writers and scholars. 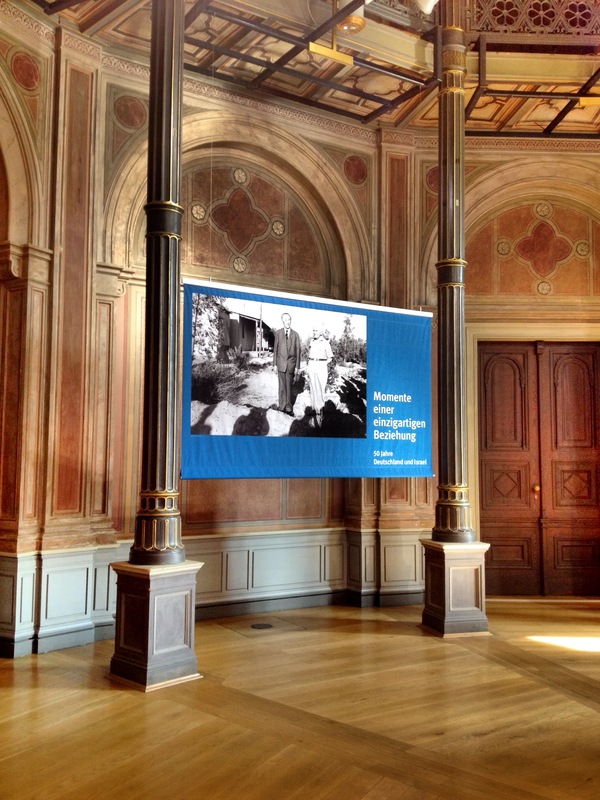 For more information on this event, see http://www.buecherverbrennung33.de/mahnmal.html (in German). 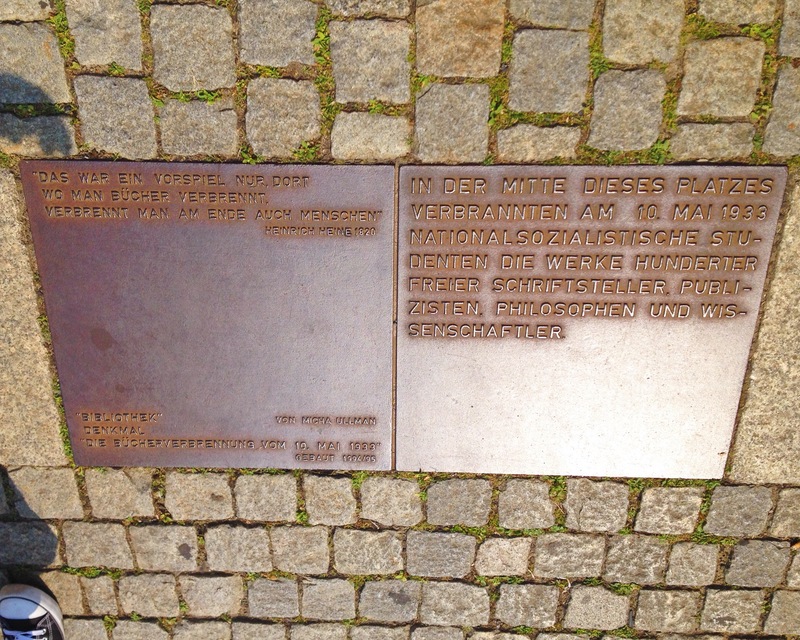 On the right is an explanation of the memorial in Bebelplatz: “On May 10, 1933, in the middle of this square, national socialist students burned the works composed by hundreds of free writers, journalists, philosophers, and scientists. ” On the left is a quote from Heinrich Heine, the German poet, writer and journalist: “That was only a prelude, there where they burn books, they burn in the end people. Heinrich Heine 1820.” Heine’s jewish descent and his radical political views caused many of his works being banned by German authorities. According to Hitler’s fascist bible “Mein Kampf,” the Jews and Chinese were classified as the lower races, they were the destroyers of human cultures. On the other hand, the Aryans with their golden hair are considered to be the superior race – the creators of human cultures…Anyway, the Chinese, in the eyes of the Fascists, were the lower race, and were thus in the same boat as the Jews. Now you can understand why I really could not take my eyes off from the sign. It was as if the sign read: “The Chinese will not be served here.” Even though Ji Xianlin did not get sent to the concentration camp, but I am guessing this: If the Chinese were as influential as the Jews were in Europe at that time, the persecution and massacre would have befallen the Chinese as well. 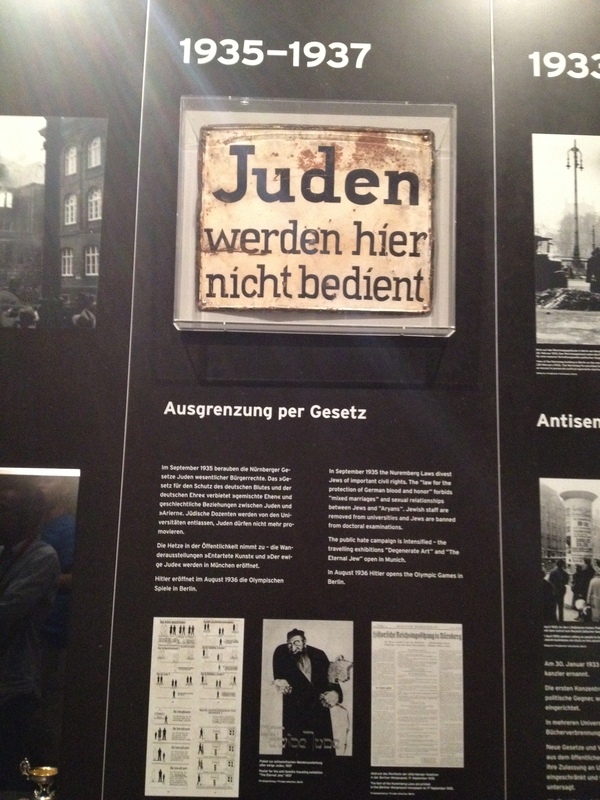 According to the other museum placards that provide information about Nazi Germany, “new laws and regulations remove Jews from the public service – their admission to universities is greatly restricted and eventually banned altogether.” “In September 1935 the Nuremberg Laws divest Jews of important civil rights. The ‘law for the protection of German blood and honor’ forbids ‘mixed marriages’ and sexual relationships between Jews and ‘Aryans’. Jewish staff are removed from universities and Jews are banned from doctoral examinations.” Not surprisingly, some of the brightest people (e.g. Albert Einstein) left Germany. Where did they go? 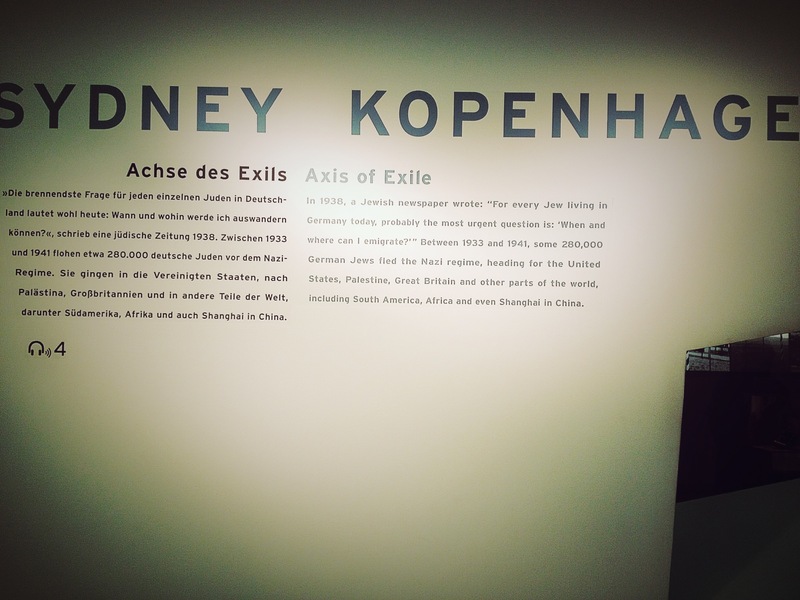 In addition to other well-known cities in the world, they sought refuge in Sydney and Shanghai! In fact, two short videos about the Israeli gratitude to Shanghai for providing refuge for the Jewish people during World War II came out last Wednesday. One of them features a short speech by the Israeli Prime Minister Benjamin Netanyahu. 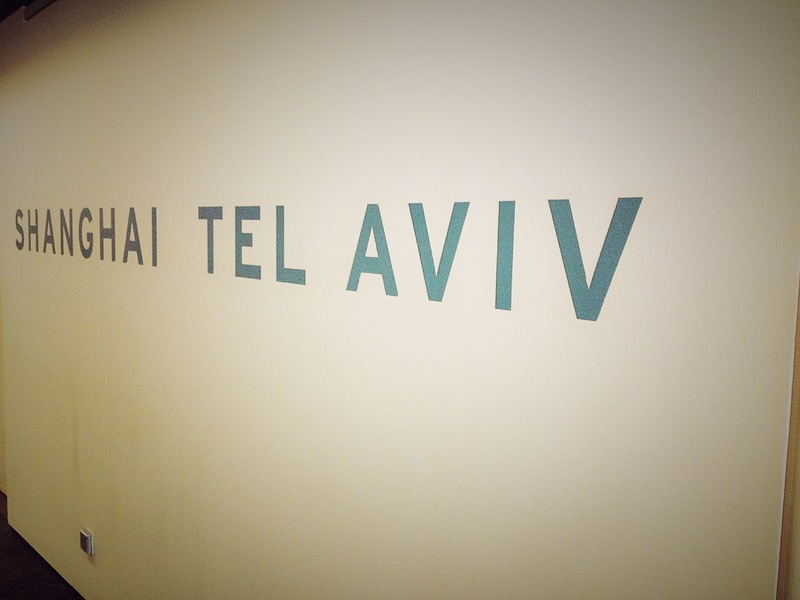 Another portrays the Israelis happily waving their hand-written “谢谢” (Thank you) at the camera. How touching! 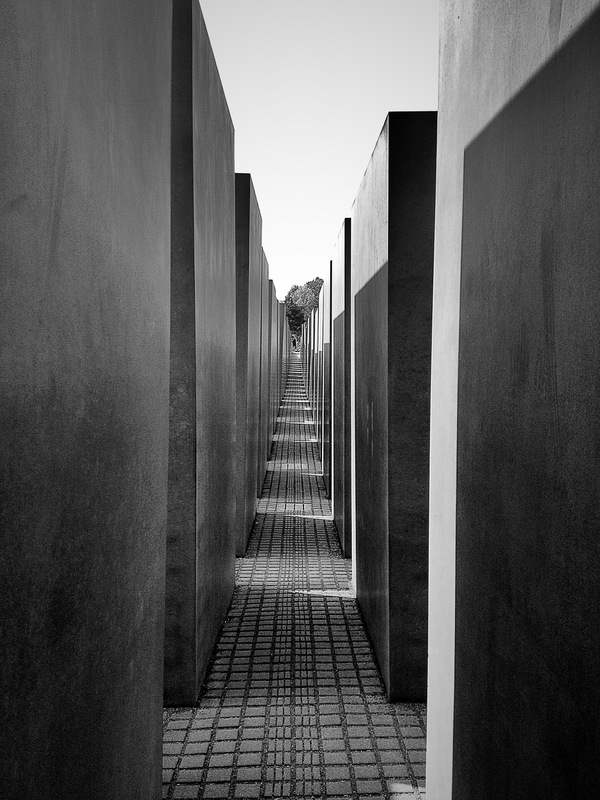 The Holocaust Memorial impresses me by its proximity to the Reichstag building. 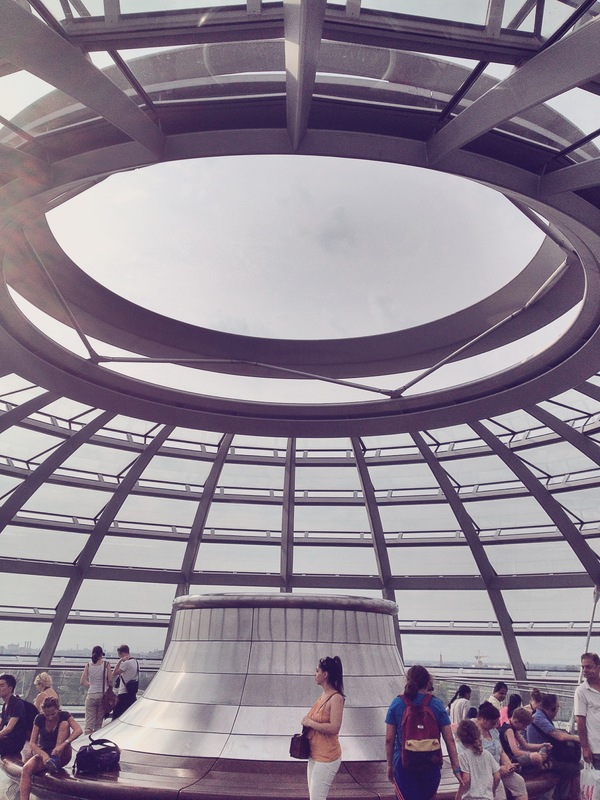 From the Holocaust Memroial, the Reichstag building is within 10-min walking distance. 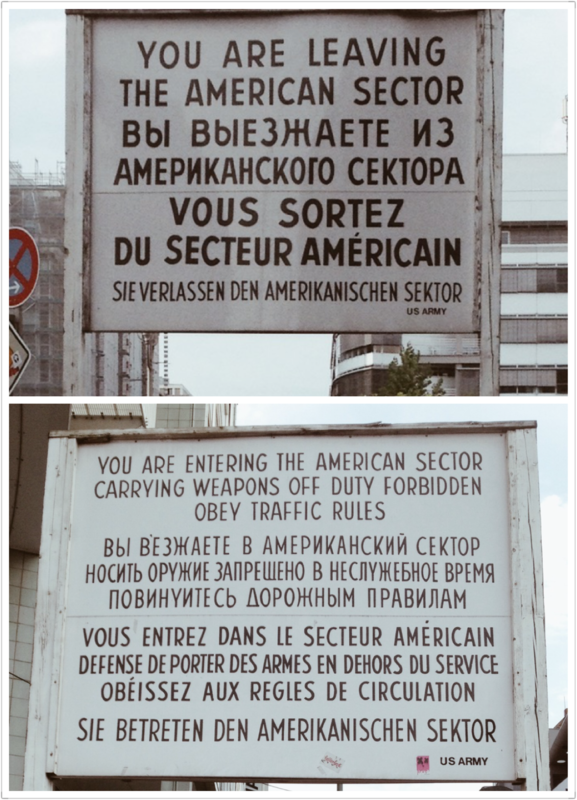 After World War II, Berlin became ground zero for hostilities between the USA and the USSR. In 1949, Germany was divided into two nation-states: die Bundesrepublik Deutschland (BRD) in the west, and die Deutsche Demokratische Republik (DDR) in the east. The former was controlled mainly by the USA, whereas the latter by the USSR. Due to the economic stagnation in the DDR, many young and well-educated East Germans fled to seek a better fortune in West Germany. In order to stop the flow of its own labour force into West Germany, the DDR built a wall all around West Berlin on 13 August 1961. 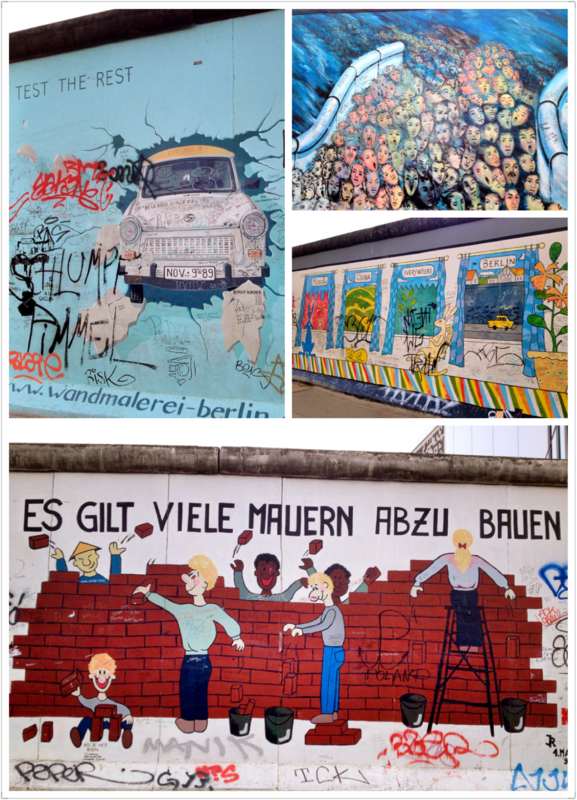 The Berlin Wall became the most visible symbol of the Cold War. Trabant P601. 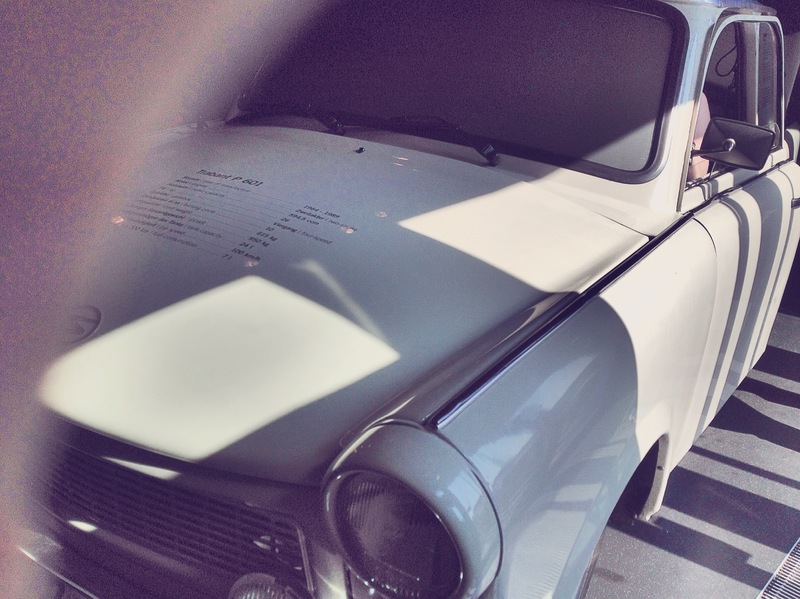 One line on the placard of the Trabant caught my attention: “Er versprach ein wenig Freiheit in einem unfreien Land.” (It [the Trabant] promised a little bit of freedom in a restrained country). The Stasi interrogation desk makes me think of the poignantly touching “Das Leben der Anderen” (2006), which paints the lives of the DDR civilians five years prior to the fall fo the Berlin Wall. 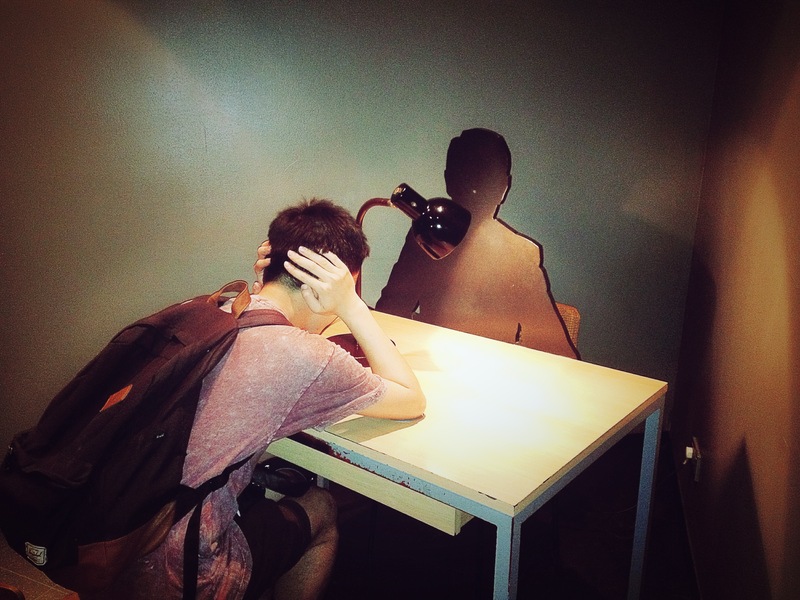 INTERROGATION You Will Talk! “Don’t worry, we have plenty of time”, said the interrogator repeatedly. The same questions for hours and the monotonous tapping of the typewriter. The remand prisoner was entirely helpless. Nothing to read, no visitors, no lawyer, sleep deprivation and strict isolation. The only person with whom he ever spoke was his interrogator. Prisoners often felt the need to get everything off their chest. In fact, this was part of the strategy which the Stasi men learned at the Stasi University of Postdam (excerpt taken from the placard of the museum). On 9 November 1989, Günter Schabowski the political member of the ruling party of the DDR announced the DDR government’s decision that “travel abroad for private rasons may be unconditionally applied for.” Tens of thousands of East Germans enthusiastically rushed through border points in Berlin and elsewhere in the country. Both West and East Germans celebrated the fall of the Berlin Wall. On 3 October 1990 the reunification of Germany was achieved without a single drop of blood, and an official ceremony was held at the Reichstag building. How seriously does Berlin today take its history? 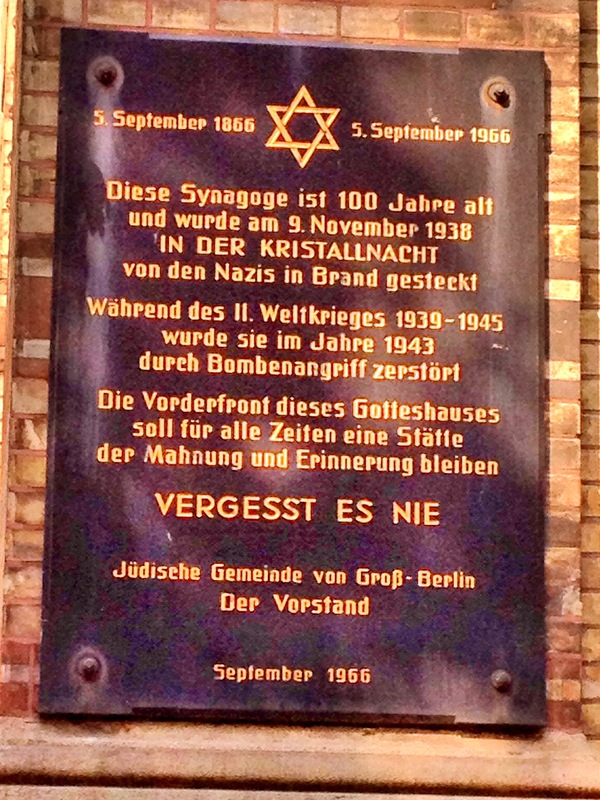 I don’t understand all the complexities of Berlin’s history but I think I have found at least some answers inside the Neue Synagogue. 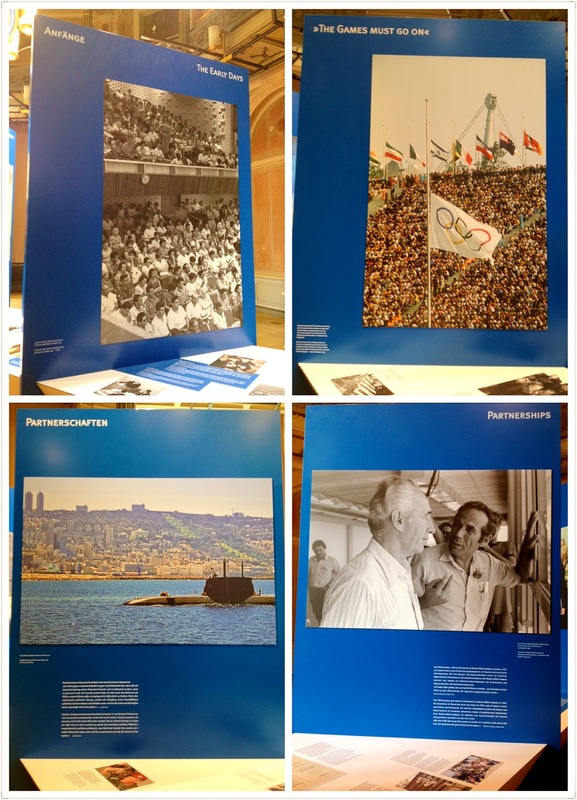 Within the Neue Synagogue, there is a special exhibition “Momente einer einzigartigen Beziehung: 50 Jahre Deutschland und Israel,” detailing some of the momentous events about the post-war relationship between Germany and Israel. Let me put this unequivocally: Israel wll receive what it needs to preserve its security, and it will receive this when needed. But as a friend of israel, it is also our right and our duty to speak up openly and sometimes publicly. Without a comprehensive political settlement, one that must include the creation of a viable Palestinian state, there will be no permanent security for Israel and the region (25 April 2002). 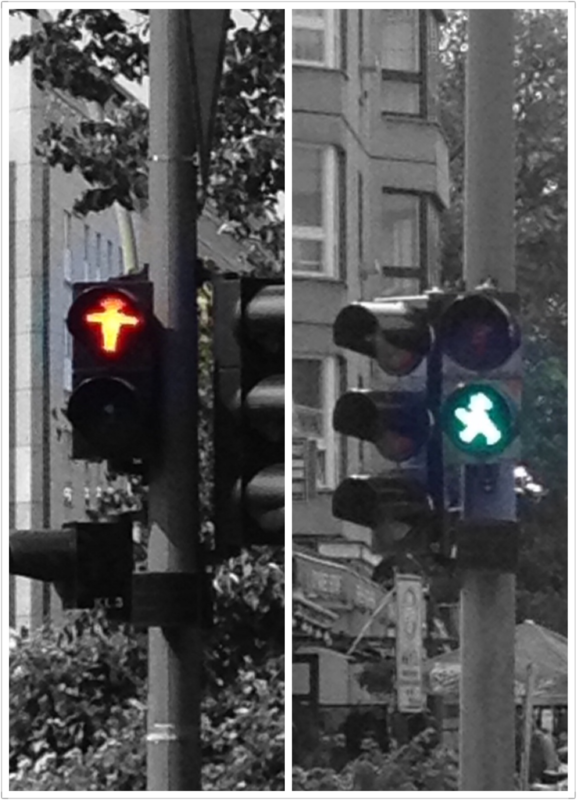 One thing Berlin has taught me is perhaps this: To bravely embrace not only the good, but also the bad memory. Not for revenge, but for mutual growth.